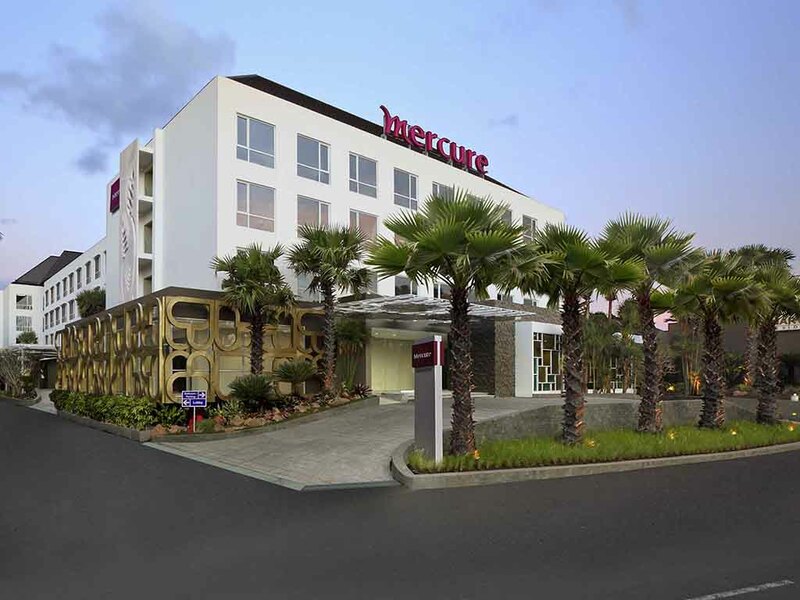 Strategically located in the heart of Kuta's famous shopping district, Mercure Bali Kuta Harvestland is very accessible from most popular tourist spots in Bali. It is less than 15 minutes away from the ever popular Kuta beach, Ngurah Rai International Airport and Denpasar City Centre. Check-in was good, staff was friendly enough, only unfortunate condition of the room was poorly maintained, bed linen was rather dirty and pillows smelled. For breakfast the menu variations are not good and the taste is only standard. Overall I'm not satisfied staying there. Nice staff and good location. Cannot rest well due tue bed squeak and noise from. The mosque and fire alarm. It wasn't a Honeymoon special though, it was well kept Hotel with Good services and warm staff. Cleaning Service Your cleaning service was throwing my things which I put in a proper way and actually I still use it Breakfast 1. Your smoking area was not cleaned up properly. 2. Puddle were not dried 3. Spoon and fork was not put on the table 4. Your waitress was not offering us coffee and tea 3. Internet conection Your internet connection was poor My overall feedback: Mercure hotels have a good repution in Indonesia. And I was surprise that your retail price is cheap compared to another mercure. But the result of low price is effected to your services. Mercure known as a 4 stars hotel and everyone knows the retail price is not cheap as you offered So please put your standard services as a 4 stars hotel like. Thank you and regards, Umar Saleh D.
Nice bed room, not nice breakfast room. I booked the room because I had some time to spend before my flight and I wanted to take a shower and rest. The hotel is conveniently located close to the airport. The hotel served its purpose well. The staff is friendly enough, but seems a bit chaotic at times. The Accor welcome drink selection was very limited. Maybe include something like a Virgin Mojito and/or some other mocktails in the list of choices? For the spa: the ladies were very friendly, but it felt a bit strange to have a spa in what are essentially normal hotel rooms, without a “proper” reception etc. That all said, the hotel offers good value for money and I will probably come again if I need to relax before my flight. Stay for 5 nites for new year, upgraded, room was standart with pool access, old dated but it was fine. Breakfast taste good. Staff was nice and helpfull. The only thing that need to improve is the pool. The pool water was dirty, perhaps so many swimmers on that time. Hope it will more clean next time. Clean rooms, freindly and efficient staff. Bountiful buffet breakfast and solid Indonesian food for dinner as well. The only downside is that it's hard to cross the road to walk to the beach. But for the price it's definitely worth it. Next time we'll get a Rojek. I stayed for relatively short time, merely two nights, and spent most of the time for prearranged program. The room is good, and the foods are good as well. pleasant and refreshing, with excellent staff. i found the stay was better than I had expected.The staff were friendly and service was good. enjoyed the food greatly. prices were reasonable for the quality and type. room was clean and all functioning,i could not fault my stay. I iked not being in the loud touristy area, and your hotel met my needs and type of person I am. staff were always pleasant and courteous and attentive. Enjoyed the ceremony and traditional dance, appreciated the respect of custom/culture that is missing in other places . I am due to return for further dental work(the reason for my visit) in 6 months and will be definitely staying with you again(bookings permitting off coarse). thankyou for my stay. thanks for ms,wiwit for the service excellent..
Nice hotel that requires a little maintenance. Was easy to move around, access and had comfortable bedding and rooms. The range of food for breakfast could be improved. Close to the city and airport, and most important , there is an Indomart just close by. I have stayed in this hotel several times. I noticed that their service has improved a lot. They have more good quality staff, especially Pak Suta. Pak Suta always shows how genuine and friendly he serves customers. In my previous review, I mentioned that he is a great asset to the hotel where he works and my opinion about him remains unchanged.